Mona R. Patel has altered her online resume and deleted all references to her association with the Baltimore Department of Social Services (DSS) and the Family League of Baltimore. Yesterday, The Brew identified Patel as the “out-of-state vendor” who netted $1.3 million as part of alleged procurement irregularities involving the former director of DSS, Molly McGrath Tierney, and the Family League. By this afternoon, all references to Patel’s work in Baltimore were deleted from her LinkedIn page. Patel also took down her Facebook page today, while Tierney, currently a senior manager at Accenture, has removed both her Facebook and LinkedIn pages. 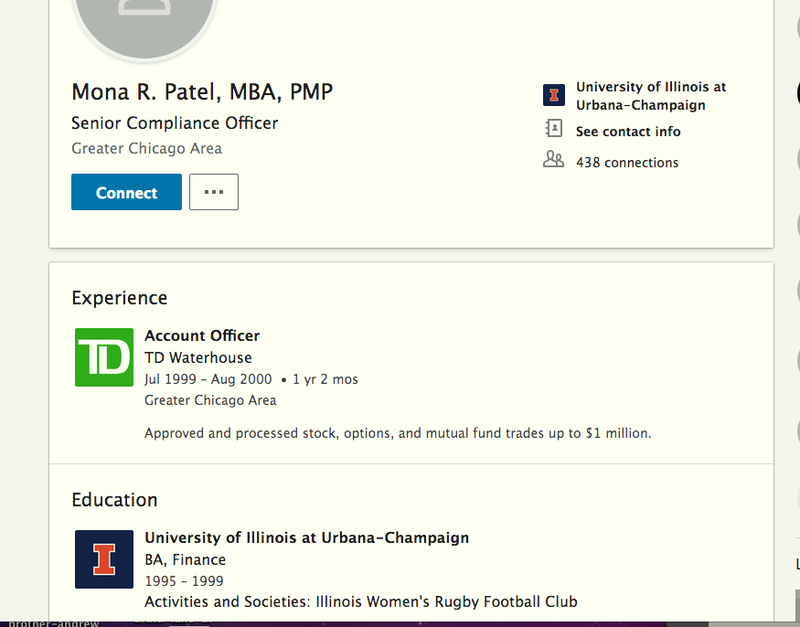 In addition to her now-truncated online resume, The Brew has learned that Monski Consulting Corp. – the Downers Grove (Ill.) company that Patel used as a pass-through for DSS payments – is “not in good standing” with the Illinois Secretary of State. Typically, that designation means that a company has not filed an annual report or paid a required fee. 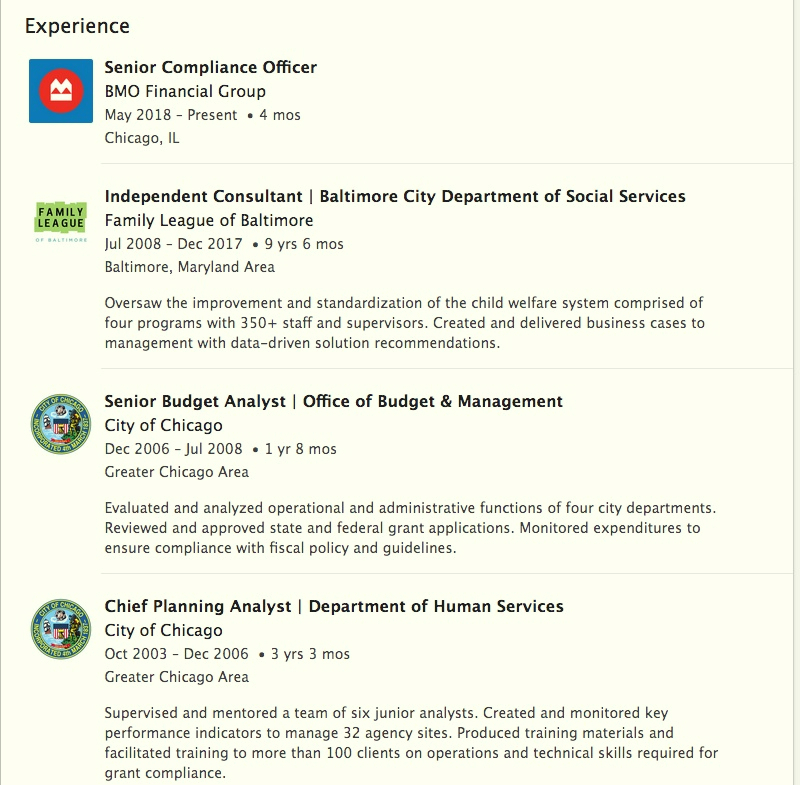 Mona Patel’s work for Baltimore’s DSS (ABOVE) was prominently displayed in her LinkedIn resume yesterday. Today, (BELOW) that work history was gone, along with her prior jobs in Chicago city government and the name of her current employer, BMO Financial Group. Patel was Monski Consulting Corp.’s sole employee when it was incorporated in 2008 shortly after Tierney joined DSS as chief financial officer. After Tierney was named DSS director, the Family League entered into an agreement to pay Monski Consulting up to $140,000 a year – and then to bill those costs to DSS. 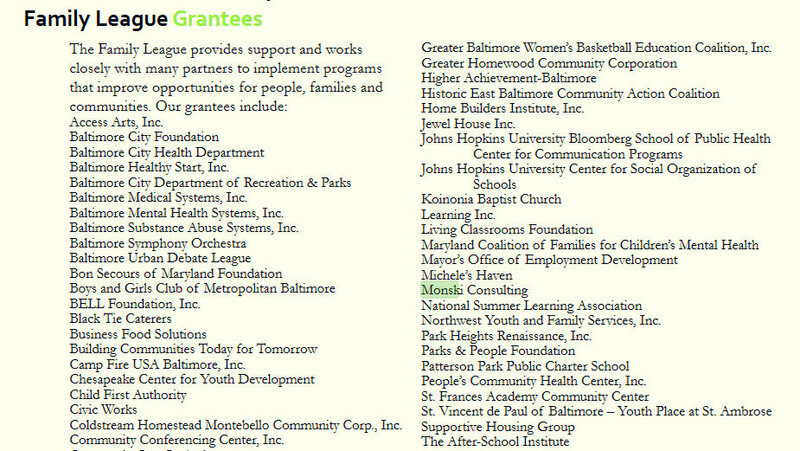 On several League annual reports, Monski Consulting was listed as a “grantee,” or beneficiary, of funds from the nonprofit –ostensibly for services rendered to poor children and their families. The first contract with Patel was struck when Rafael Lopez was the CEO of the Family League. Today, Lopez is Molly Tierney’s colleague and supervisor at Accenture’s health and human services practice. The relationship between Tierney and Patel apparently dates back to the early 2000s when they worked together at the Chicago Department of Human Services. Tierney was the department’s deputy commissioner and Patel was a data analyst. Patel came to Baltimore every month or so, reportedly to run errands for Tierney and to socialize over dinner. Numerous attempts to reach Tierney and Patel over the last week have been unsuccessful. A recent Office of Legislative Audits (OLA) report says there was sparse evidence that Patel did any substantive work for the social services agency in return for the $1.3 million she was paid between 2009 and 2017. The Monski Consulting contract was terminated on December 31, 2017, or five months after Tierney resigned as DSS director. The financial dealings uncovered by OLA are now the subject of an investigation by State Prosecutor Emmet Davitt. Mona R. Patel’s Facebook page was taken down today.